Caroline Lucas, MP for Brighton Pavilion and leader of the England and Wales Green party, will today attend the protest by ‘Occupy London Stock Exchange’, which has continued for the last three days, with hundreds of demonstrators camped outside St Paul’s Cathedral, close to the heart of the City of London financial district. Initially, the police had tried to disperse the crowd on Sunday, but were stopped by the Rev Dr Giles Fraser, canon chancellor of St Paul’s, who was happy to see the peaceful protest continue. 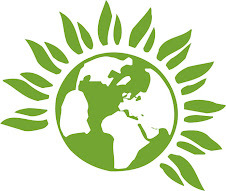 The Green party leader said, “As awareness increases of the injustice and unsustainability of the global economic system, more and more people are taking to the streets in opposition. 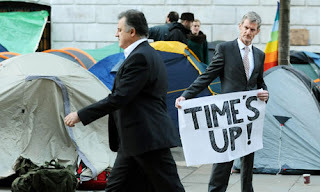 "The camp that has been set up a stone's throw from the London Stock Exchange is an opportunity to explore a different kind of future to the one the mainstream political parties have constructed. "The authorities must now respect the right to peaceful protest. "If they have any sense, they will also start to listen to the voices of those ordinary - and extraordinary people - who want to invest in a greener, fairer future rather than the stocks-and-shares house of sand that sustains corporate capitalism." The demonstration was inspired by the ‘Occupy Wall Street’ movement in the United States, and spread to many cities financial districts all around the world, with the same aim, of calling for an end to the disastrous corporate capitalist system which is ruining lives everywhere, and is the effective cause of the worldwide financial crisis. We are of all ethnicities, backgrounds, genders, generations, sexualities, dis/abilities and faiths. We stand together with occupations all over the world. We refuse to pay for the banks' crisis. We support the strike on 30 November and the student action on 9 November, and actions to defend our health services, welfare, education and employment, and to stop wars and arms dealing. We want structural change towards authentic global equality. The world's resources must go towards caring for people and the planet, not the military, corporate profits or the rich. Brilliant! I am struggling financially, too because of an economy based on home-ownership and shares. Cameron is completely up in cloud-coockoo-land. Incidentally, in a recession, the government should spend, spend, spend. But he even tells people to cut down on food portions! What a load of codswallop: First we should work till we drop dead with no pension, then we should stop eating. as we will not receive the healthcare either! Who benefits? Have your guesses (millionaires do).